Enlarge / That’s not a Warhol. That’s the material described here, showing fine control over whether it’s hotter or colder than its surroundings. I love light and the various manners in which we can control it. It’s a good time for me, as we are truly in a golden age of light control. We can manipulate it to see details that would otherwise be invisible. We can guide it around objects so that they are invisible. Light has been made to stand still and dance on the pointy end of pins. All this control of light is indirect, coming via our control of materials that the light interacts with. 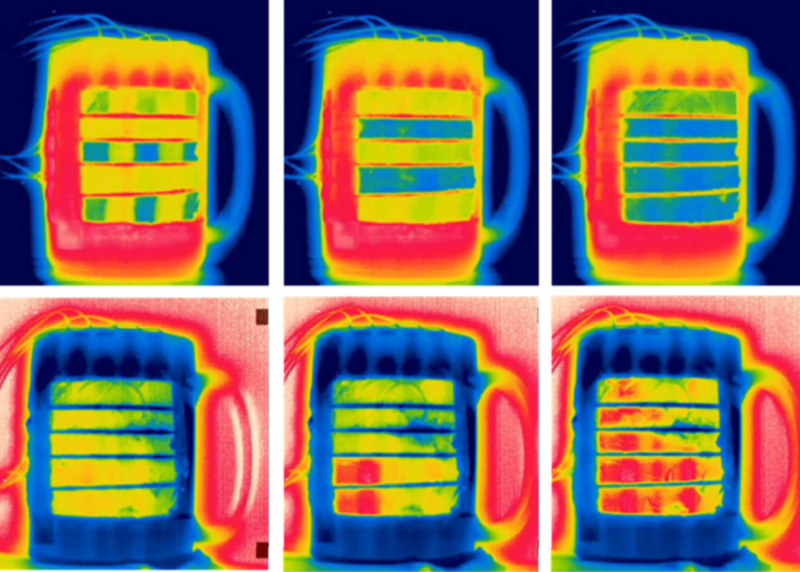 Now, researchers have crafted a material that adapts its properties so that its infrared appearance is either hotter or colder than the object it encloses. In other words, hot objects appear cold, or cold objects can appear hot—it’s infrared camouflage. So, do you make yourself some infrared camo gear? The basic procedure is to control the efficiency with a material that can emit infrared radiation. Take gold as an example. Gold is a nearly perfect metal: it has high conductivity and does not absorb infrared radiation very easily. That means it will reflect incoming radiation; this is why emergency blankets have a thin gold coating: the gold reflects your own infrared radiation back to you to keep you warm.